The 2018 season begins on May 26 and runs through September 30. Our sailing times vary daily as we fish the tides. Use our Sailing Schedule to determine departure times for your preferred fishing dates. Choose several dates, if possible. Weekends are always in high demand - be sure to place your reservation early! Call us direct at 508-255-0018 to confirm availability and to make reservations. 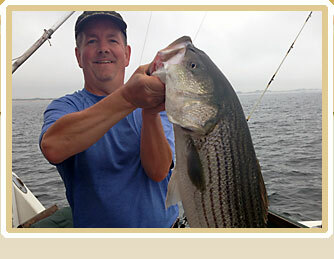 Enjoy the finest sport fishing on Cape Cod with Captain Stu Finlay aboard the Empress. The Empress is a comfortable custom 39-foot diesel powered fiberglass sportfisherman. Captain Stu and his experienced crew cater to novice fisherman as well as experienced anglers. The Empress sails daily from Rock Harbor in Orleans, Massachusetts. We offer Half Day (min. 4 hours) and Full Day (max. 8 hours) fishing charters for Striped Bass and Bluefish. All the equipment you will need is furnished. Call us with your questions or to reserve your trip - 508-255-0018.